This is one of the city's most elegant and distinguished apartment buildings. Not only is it entirely clad in limestone, but its many unusual and notable design elements predate Art Deco flourishes with a quite bold, yet restrained composition. The building was erected in 1915 and converted to a cooperative in 1978. 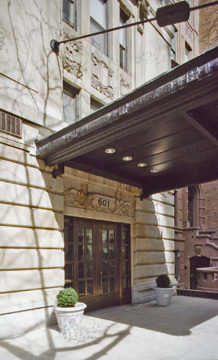 The building's facade is nicely modeled to accent its verticality, but is punctuated by a very large wrought-iron entrance marquee and large balconies on the fourth, fifth and twelfth floors. 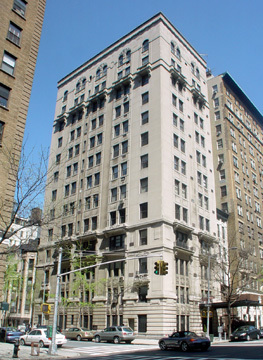 The 13th floor has arched windows below the building's simple cornice. The 13-story building, which has no doorman and no concierge, has only 26 apartments. 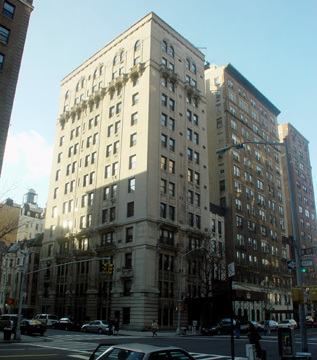 It was designed for Bing & Bing by Emery Roth, the architect who would later design such masterpieces as the San Remo and Beresford apartment towers on Central Park West and the Ritz on Park Avenue and 57th Street. 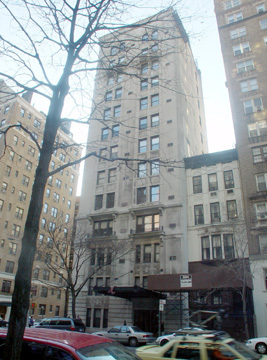 In his fine book, "Mansions in the Sky, the Skyscraper Palazzi of Emery Roth," (Balsam Press, Inc., 1986), Steven Ruttenbaum observes that 601 West End Avenue "exhibits an eclectic mixture of neo-classicism and the Vienna Secession" and is "notable for its discipline and sobriety." The building, he wrote, originally had only one apartment per floor. According to Peter Salwen, the author, Jesse L. Lasky, the theatrical and burlesque producer, lived here. 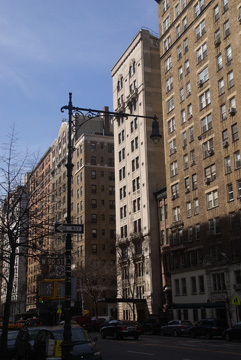 In his fine book, "Upper West Side Story, A History and Guide" (Abbeville Press, 1989)," Salwen wrote that Lasky had been convinced by his brother-in-law, Samuel Goldfish, a glove merchant, to go into the movie business and "they teamed up with neighbors Cecil B. DeMille and Adolph Zukor (both of West 114th) to form Lasky-Famous Players, with studios on West 23rd and West 56th." "Goldfish, forced out in 1915, changed his name to Goldwyn," Salwen continued, "and created the organization that became Metro-Goldwyn-Mayer. The original business moved its headquarters to sunny California soon afterward, but still did business under a West Side name: Paramount Pictures, named for the Paramount apartment house (still standing) at 315 West 99th....Even as young men, it's pleasing to report, they showed the imagination that would make Hollywood great. Glove importer Goldfish had realized he could avoid customs duties by shipping crates of left and right gloves separately to, say, New York and New Orleans, leaving them unclaimed, and later buying them for five dollars or so at the abandoned-property auction, where it was a good bet no one else would bid against him for a shipment of unmatched gloves." The building has no sidewalk landscaping and discrete air-conditioners. The building has inconsistent fenestration.